Adam Driver | Cinema, etc. While We’re Young is the latest film from Noah Baumbach, following the recent critical successes of 2010’s Greenberg and 2012’s Frances Ha. The film stars Ben Stiller as established documentary filmmaker Josh, now struggling to find the inspiration and money to finish his current project, and Adam Driver as young aspiring documentary filmmaker Darby, who seemingly hits on endless streams of ideas without much effort. Naomi Watts and Amanda Seyfried also star as Josh’s wife Cornelia and Darby’s wife Jamie, respectively, though the men take centre-stage as the focal point of the slow-reveal story. This is an excellent film with an intelligent theme. As is often the case with films about filmmaking, the central characters are extremely rich in backstory and well-realised. Ben Stiller himself is an actor, director, producer and writer (his last feature as director being 2013’s admirable The Secret Life of Walter Mitty) and I’m sure he drew on his experiences to add depth to his character. He brilliantly paints the frustrated picture of a man desperate to stay true to the values of filmmaking whilst at the same time reacting in disbelief that nobody else wants to follow that same journey with him. It’s yet another example of Stiller at the top of his game and it’s a shame that the box office receipts for his more serious roles are inevitably dwarfed by those of, for example, the Night at the Museum franchise. 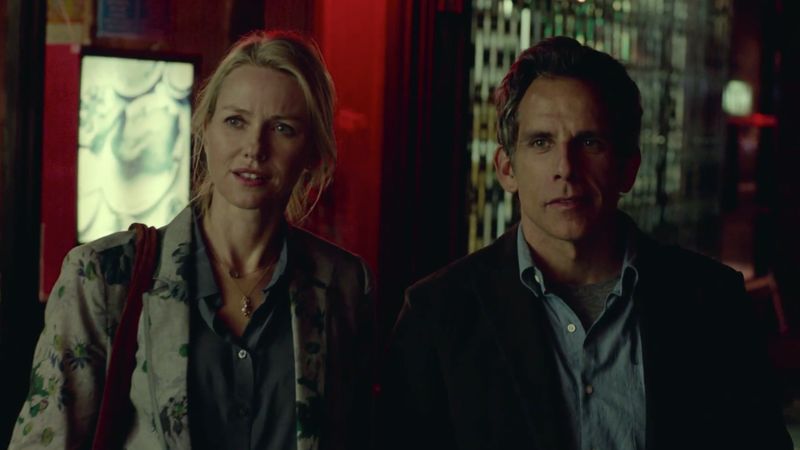 Naomi Watts and Ben Stiller co-star in While We’re Young. Both couples give the impression of aspiring to live out of their own time and the emotional plot devices are driven by the fact that the elder couple is far less comfortable trying to fit in with the younger generations than vice-versa. For Darby and Jamie, attempting to remember a morsel of information they’d forgotten is the source of great fun; they are determined to avoid becoming reliant on modern technology when it is to the detriment of thought-provoking discussion. Conversely, Josh and Cornelia are much quicker to jump onto their tablet device to find their answers as they would rather find the solution as quickly as possible. This was initially a clever role-reversal to aide character development, though it becomes a key part of the plot further down the line (and one which I won’t go into here). One of my favourite aspects of the film is the excellent soundtrack. James Murphy (of LCD Soundsystem fame) provides the original score and has compiled a playlist of original songs, including Paul McCartney and Wings, David Bowie and Haim. The song choices mix the old and new in a way that underlines how little the musical landscape has changed, but it also serves to reflect the dovetailed lives of our four main characters. The songs sit side-by-side with one-another and the particular choices are all artists that would be deemed fashionable by the Topshop generation, either in a serious or ironic way. It is a critical time in Adam Driver’s career. Regardless of whether the upcoming Star Wars films are successes or flops, it is inevitable that the careers of the main stars will be defined for the foreseeable future by such a massive franchise. Both Driver and his co-star Oscar Isaac have been rapidly adding to a varied list of assured performances in the last year or two, though less has been happening with John Boyega and Daisy Ridley, who are being touted as the main stars. This could potentially be seen as a risky strategy. Driver can be happy that he can add this excellent performance alongside his roles in Lincoln and Inside Llewyn Davis as prime examples of his acting ability. Oscar Isaac is already well-established with plenty of huge roles under his belt. Time will probably prove that this was a wise move for their post-Star Wars careers. This film is highly recommended and should be sought out if you get the chance. You simply can’t argue with such an intelligent script, especially when it’s delivered in a package like this. While We’re Young is on general release at cinemas in the UK now.